Don’t you just love a good kitchen makeover? I do! And what I love even more is seeing kitchen makeovers on a budget, where most of the main elements are re-used. I’ve come across some really amazing makeovers lately, and thought I’d pass them along to you for inspiration. That doesn’t even look like the same kitchen, does it?! I really like the black lower cabinets with the white upper cabinets. 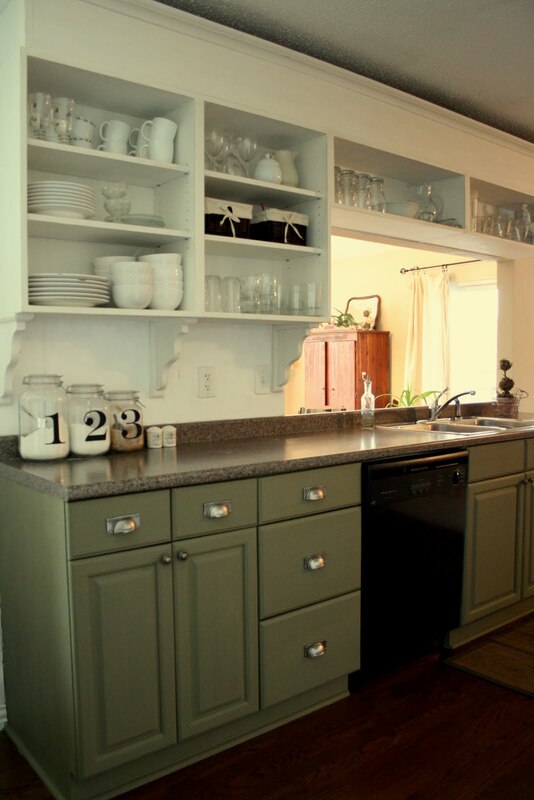 Also notice how the tops of the cabinets were extended, and corbels were added underneath the upper cabinets. This next before and after from Creatively Living Outside The Box ties right in to this week’s poll about open kitchen cabinets. 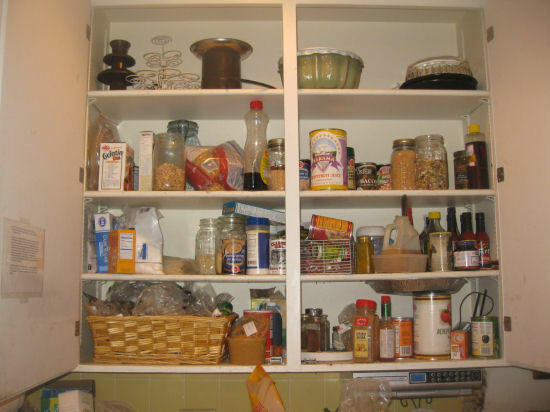 I think even those of you who voted that you don’t really like open cabinets will still be able to appreciate the amazing difference this makes. This cabinet started out looking like probably many of our cabinets on the inside, behind closed doors…things jumbled and piled, and certainly not anything you’d want on display. I think that’s a pretty remarkable makeover! Can you handle more awesomeness? ‘Cause I have one more, this time from The Virginia House. Aren’t these great?! 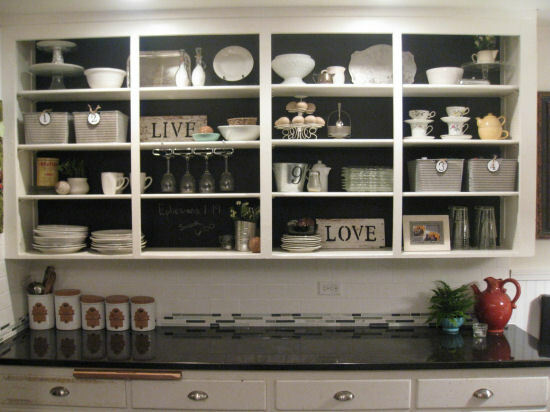 I think these homeowners did amazing jobs working with what they had and totally transforming their kitchens with paint, a few added details, and a bunch of creativity! Previous Post Out of Curiosity:: Open Kitchen Shelving? I asolutley love looking at pictures of before and after kitchens!! I'm obsessed with kitchens, love all the pictures!! I love it that you are following Creatively Living Outside the Box – she is fantastic! 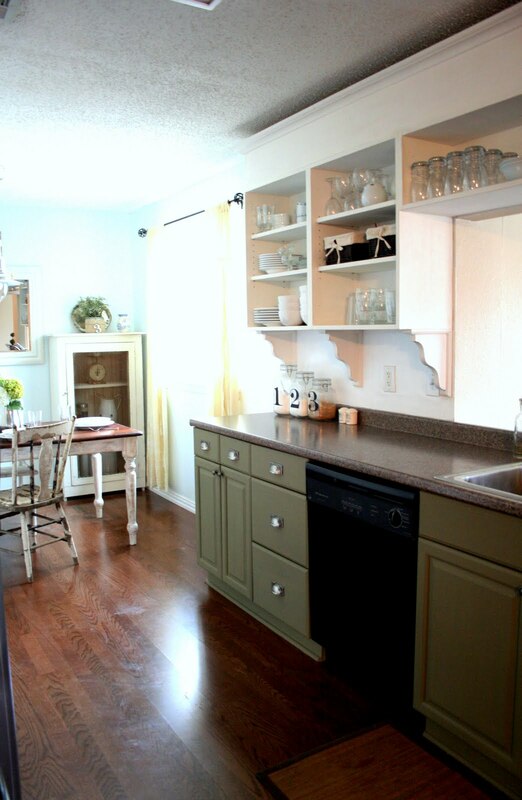 Wow – even though these kitchen makeovers are so different, I love them both! They are both so tidy and organized, to boot. I just found your blog & am so addicted. I'm your newest follower. These are great. I love the color used on the bottom cabinets in the last pictures. I have such a soft spot for white china in open kitchen cabinets, just love it! I'm a little scared of painting kitchen cabinets. We live in Texas and have been told that Texans love wood and it would affect the resale value of our home if we painted… Any opinions on this? NumberMonkey, I'M in Texas!! 🙂 Just remember…not ALL wood is good. For example, the blonde oak cabinets from the 80s (that by now have turned orange) are NOT good for resale. If you have those, by all means, paint them!! However, if you have something current, then the wood finish can definitely be good for resale. But I would certainly differ with the assessment that "Texans love wood." Some wood…yes. Some wood…definitley not. But it looks so good. My appliances are new and will be going with me and they are black and as you can see the kitchen is small. I hope to be featured on your site someday with my before and after so all suggestions are appreciated. Love this blog. I'm a of painting kitchen cabinets. They live in Illinois and was told that the Texans love tree and this would affect the value of resale of our home if they.